Are you testing your applications for security vulnerabilities? Nearly one-third of all security compromises happen at the application level, but many organizations avoid critical testing because specialized skills, budget and time are in short supply. With cloud application security services, you gain the advantages of cloud — flexibility, automation, speed, cost-effectiveness — and the expertise of leading consultants to help you improve the security of your apps. IBM Application Security on Cloud Consulting Services solution is designed to meet a range of your organization’s needs, from a quick training session on the IBM Application Security on Cloud SaaS product for your team, to deeper security consulting services. 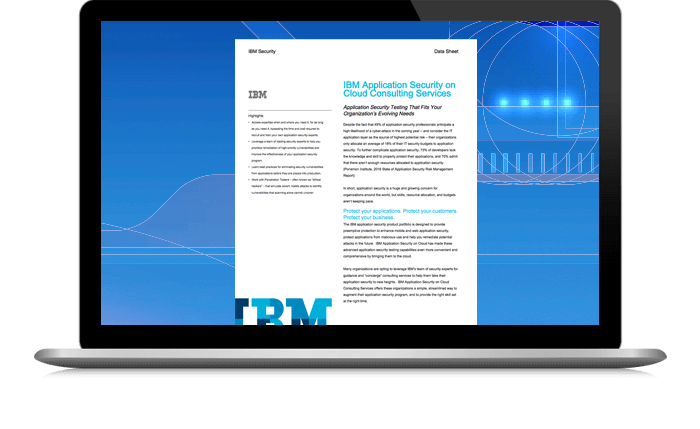 Get up to speed quickly with expertise and guidance on the IBM Application Security on Cloud testing and risk management features. Get help with reviewing test results and dashboards, and learn how to prioritize the remediation of vulnerabilities in your apps. An IBM consultant configures and runs your scan, validates the results, walks through the results with you, and suggests how to prioritize fixes. An IBM “ethical hacker” conducts a controlled, manual interrogation of your application to identify vulnerabilities. Work with IBM security consultants to accomplish your specific goals, such as code review, remediation support, and program management. Purchase and redeem engagement units for the services you need when you need them. Try the IBM cloud-based web and mobile application security testing product. Watch a brief and entertaining video about how to identify and remediate application security vulnerabilities effectively with IBM Application Security on Cloud.